We compared the effects of two diets on glycated hemoglobin (HbA1c) and other health-related outcomes in overweight or obese adults with type 2 diabetes or prediabetes (HbA1c>6%). We randomized participants to either a medium carbohydrate, low fat, calorie-restricted, carbohydrate counting diet (MCCR) consistent with guidelines from the American Diabetes Association (n = 18) or a very low carbohydrate, high fat, non calorie-restricted diet whose goal was to induce nutritional ketosis (LCK, n = 16). We excluded participants receiving insulin; 74% were taking oral diabetes medications. Groups met for 13 sessions over 3 months and were taught diet information and psychological skills to promote behavior change and maintenance. 31% discontinued sulfonylureas in the LCK group, compared to 5% in the MCCR group (p = 0.05). The LCK group lost 5.5 kg vs. 2.6 kg lost in MCCR group (p = 0.09). Our results suggest that a very low carbohydrate diet coupled with skills to promote behavior change may improve glycemic control in type 2 diabetes while allowing decreases in diabetes medications. This one I was first alerted to by @keithgraham over on Twitter when it first "hit the stands", so a tip of the hat to Keith. 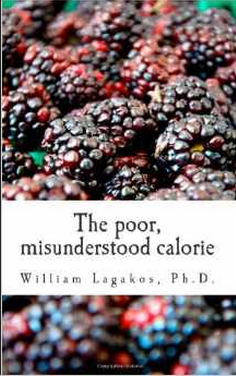 But it was also making the rounds because the Poor Misunderstood Calorie Guy (Bill Lagakos) blogged on it as well. My first reaction to this was why they are still wasting money mucking around in the pilot study weeds? Pilot studies almost always end up with wishy washy results that are horribly confounded by any number of factors and/or are too small in size to elucidate anything to statistical significance. So, seriously ... Ketogenic diets have been used in epilepsy and other applications including for at least 6 months in diabetics, and determined "safe" for the duration of these trials. This was a pilot study only in the application of the lead author's psychology/education part of the program. My second reaction -- without even reading further than the abstract -- was that we're probably again looking at different medications being taken and the ones being discontinued being those involved in controlling postprandial hyperglycemia. I was not reacting in haste there, and then some! Coupled with my third reaction/feeling that we'd be in for deja vu all over again with reporting, compliance and control issues. And again, this study did not disappoint ... or rather it did. Eligible participants provided written, informed consent and were randomly assigned following block randomization procedures (computerized random numbers in blocks of four) to either the MCCR or LCK diet created by the first author. An assistant, not associated with any other aspect of the research, concealed the sequence in opaque envelopes, which were opened by other research assistants unaware of the sequence. For this trial, it was not possible for the participants and staff to be blinded to group allocation. To reduce potential intervention contamination if two related pairs of participants (a mother and a daughter, two sisters) were assigned to different groups, each pair was assigned as a unit, using pre-specified procedures for participant pairs; this was done for two pairs. This description almost comes off as defensive, and given the outcome of the randomization in terms of group composition and baseline measures, I can see why. Somehow they ended up with 16 and 18 for some reason, and what was the deal with having two pairs of immediate relatives in the study? Most pilot studies define their criterion more narrowly rather than less -- it is not unusual for such trials to be limited to one gender, narrow BMI range, no meds or all the same meds, no other health issues, etc. Not this study. They included overweight and obese (rather than a designated range of BMI). It makes no sense to include pre-diabetics in this study at all, but they included four, and by chance, three went to the MCCR. Putting together information from the text and Table 1, there were 5 unmedicated diabetics, split 3 LCK and 2 MCCR. Initially one diabetic in LCK was taking four medications, including one injectable (exenatide/Byetta). This individual should have been excluded on two accounts so it is lucky he/she moved away and was not included in the analysis. Still, all percentages reported at baseline include this 16th participant. Here's how the groups "fell out" at random in terms of baseline measures. One nice thing about small studies like this is that individual data is sometimes provided, as was the case here. 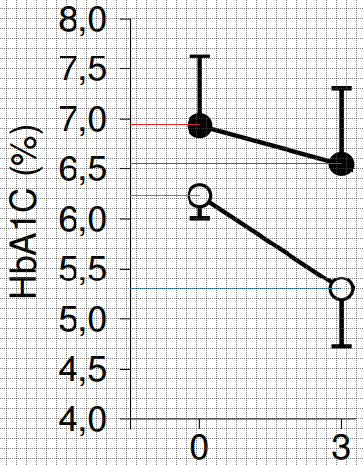 I cropped together the baseline plots for HbA1c, FBG and Triglycerides. Just look at what else happened "by chance" in terms of significant differences between groups. The means in the table above, especially with the HbA1c, obscure the distributions which will also become important later on. While the means are not statistically different, the distributions raise some questions as to the interpretation of results. 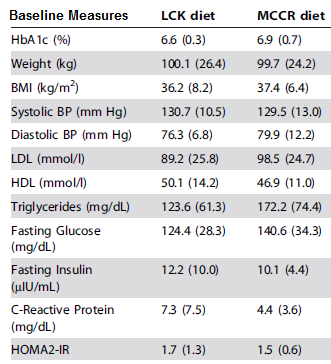 Almost all of the LCK group has good glycemic control at baseline with HbA1c ≤ 7.0 . One third of the MCCR group had HbA1c > 7.0 at baseline. Two-thirds LCK's (10) have normal triglycerides ≤ 150 mg/dL, with 6 having trigs under 100 mg/dL (including 3 at around 50 mg/dL). While 10 of the MCCR group also have normal trigs, only 2 have trigs slightly below 100 mg/dL. On the high side with trigs over 200, there is only 1 in the LCK group vs. 5 in the MCCR group (including 1 over 350). While we believe that extending the results to persons with prediabetes requires further study due to the small numbers studied, the inclusion of persons with prediabetes likely made it more difficult to detect a difference in HbA1c between diet groups because we included individuals with more limited room for improvement than individuals with frank type 2 diabetes. All the more reason not to include them at all in the study at all, an REASONS ALL why randomizing may not have been the best course of action for a study of this nature seeking to compare groups. Note: I omitted #1 of LCK that dropped out, #13 from MCCR also took Acarbose. The sulfonylureas stimulate insulin secretion and their main side effect is hypoglycemia. Therefore reducing or discontinuing these with a reduced carbohydrate intake is a "no brainer", just as a low carb diet requires less insulin with meals in both T1's and T2's on insulin therapy. Januvia is a DPP inhibitor that blocks incretin breakdown. Below is the criteria for medication management. Interestingly, there does not appear to be such a concern for the MCCR group. Given as all but one of the LCK group were under HbA1c of 7% at baseline, it is not surprising that these meds were discontinued in all of the LCK's taking them. So the diets were ascertained using a 24 hour recall online survey. This was done at one or two time points for a single day's intake. 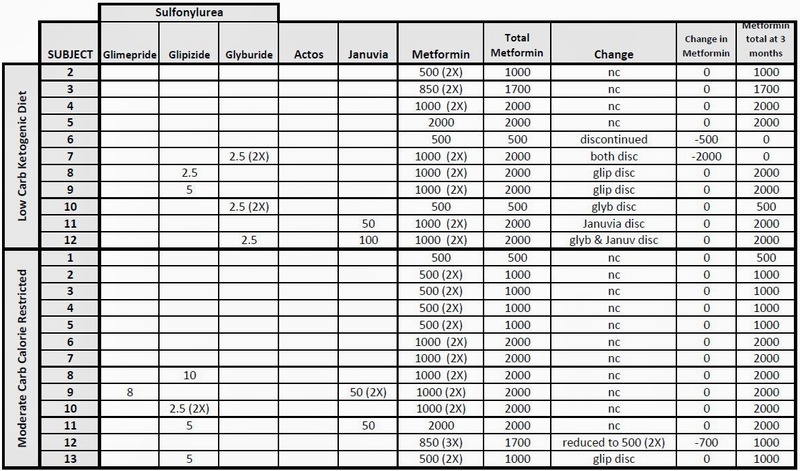 It is unclear because for MCCR they state that the caloric deficit/calorie goals are set to be 500 below maintenance needs estimated using the Institute of Medicine Dietary Reference Guidelines (same as for table in this resource). Keep in mind that the LCK group was 44% male vs. 21% for MCCR which might explain the differences in intake. Given as the average weight for both groups at baseline was almost identical at around 100 kg (220 lbs), the female-dominated MCCR group was considerably more obese (which is only somewhat reflected in BMI). Anyway, these are the claimed intakes. Note the emphasis on claimed. While our diet data are reported in Table 2, at least 20% of daily energy intake is ‘‘missing’’ at baseline [more like 50%]. It is well established that the typical ambulatory adult expends between 30–35 kcal per kg daily. Our participants at baseline (body weight about 100 kg) should thus have required 3000–3500 kcal daily to be in energy balance, yet they reported 2200–2400 kcal of daily intake. Furthermore, at 3 months our subjects reported daily energy deficits of about 700 kcal per day, whereas their weight losses (particularly in the MCCR group) reflected a substantially smaller energy deficit. We thus believe the dietary intake data are likely to reflect in part what participants understood we wanted to hear. At least these researchers are not calorie deniers all the more reason to use SOME type of better assessment to insure a 500 cal/day target reduction. No? "... provided specific suggestions for the amount of carbohydrate units participants should eat at each of 3 meals and 2 snacks. Most participants were asked to eat 3 carbohydrate units per meal and 1 per snack, or roughly 165 grams of carbohydrates a day"
They hit close to this at 160 grams (in text, 139 g reported in table was net carbs), however, the target was 45-50% carb. Therefore, although reported fat was cut, it didn't make the numbers. Below I used 1500 calories as the target diet and figured out the macro intakes. As you can see, the fat intake was too high to make the (absurd) 35% cut-off for a low fat diet. The MCCR diet was not low fat. Indeed as there was under-reporting involved, and fat is the most commonly under-reported macro (especially when meticulous weighing/measuring is not involved) it may well not have differed at all from baseline in terms of percentages. Some might describe these differences as inconsequential but it's pretty much the whole point. While not intended to be a "high carb" diet, it was "carb controlled" and the amount of those carbs was supposed to put the person in the 45-50% range. They ended up at about 40% carb, basically no different from baseline. This MCCR diet seems rather confusing and I'd hope confusion was cleared up in the meetings, but I'm not impressed with the effort here to personalize the approach and at least target a specific caloric deficit and macro percentage. I'm thinking minimum 3-day averaged food diaries for weight maintenance and work from there? Or calculate baseline needs and see if those can be followed with weight maintenance for a week or so? Because of concern that participants in the LCK group on diabetes medication other than metformin might develop hypoglycemia (particularly if they were taking sulfonylureas) if the diet was particularly effective, these participants were asked to measure their capillary blood glucose levels in the morning (fasting) and just before dinner using a home glucose meter. The study physicians used these blood glucose levels determine whether lowering diabetes medications should be recommended due to low glucose levels over the course of the study. ... Eligible participants provided written, informed consent and were randomly assigned ... to either the MCCR or LCK diet created by the first author. ... The LCK diet classes were taught by an author of the manuscript (LS), who is experienced in using the low carbohydrate dietary approach. 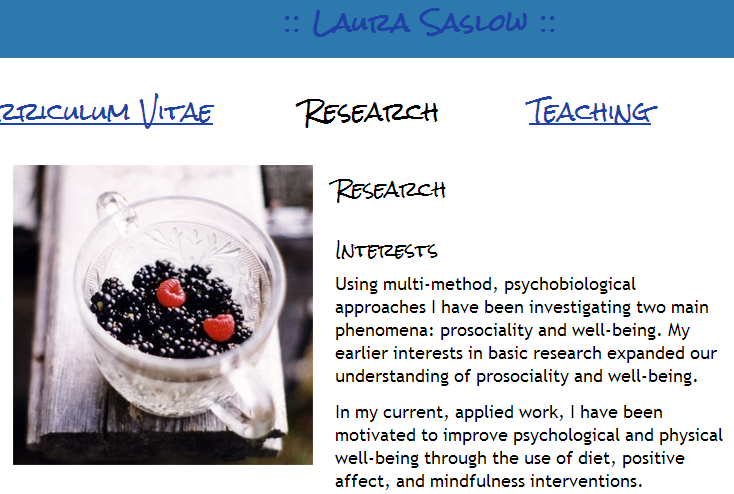 LS is not just "an" author, she is the lead researcher. Experienced in a low carb diet? Strange. They brought in an outside dietitian (RC) for the MCCR group who was not involved in conception and design of the study. RC's role as one of ten authors appears to be instruction for the MCCR group and she did a mahvelous job [/snark]. In the end, we have some measure of adherence for the LCK dieters in that ketone readings were within targeted range for the intervention in a high percentage of subjects in that cohort. Weight loss or caloric deficit was not a specified goal so all that had ketones measured and within desired range would be in compliance. That's a tough measure to "fudge". We have nothing comparable for the MCCR group. Its a half-arsed "intent to treat" if at no point during 13 sessions this group wasn't monitored for compliance and/or counseled when there was a failure to lose weight. If anyone is going to argue that the weight gain, especially that of the person gaining 15 lbs, is due to adhering to a "high carb" MCCR, there is no hope for you!! The primary outcome is listed to be HbA1c. 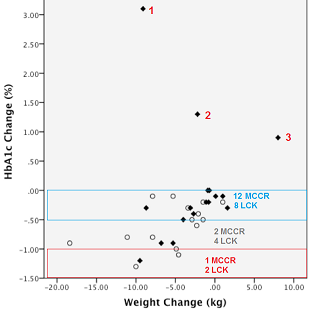 At 3 months, mean HbA1c level was unchanged from baseline in the MCCR diet group, while it decreased 0.6% in the LCK group. Ummm ... I'd say that applying the benchmark applied in virtually every study, when you don't account for gender and get a p = 0.04 (stat.sig.) and you do account for gender and get p = 0.06 (not stat.sig.) ... that's kind of a big deal. Perhaps the abstract should have read: there was a significant difference in mean HbA1c, but after controlling for gender, this did not persist. In any case, it gets even less dramatic when individual results are looked at. I have highlighted 1,2,3 on the MCCR side and identified these points in the plot from the paper at right. There was "no change" in HbA1c with the MCCR diet. That's if you look at the means and pay no attention to the individual responses. Half of the LCKs saw relatively insignificant reductions (under 0.5%) in HbA1c ... perhaps because they were not as diabetic and/or better controlled to begin with. There is no relationship between weight loss and HbA1c? This is what the authors claim. I'm not so sure of that though I don't have the time to try to put numbers into a program to determine if that is the case for each diet group separately, especially if #1 is thrown out as a true outlier here. There is just something really fishy to me about the three HbA1c gainers if you ask me. I know ... tres unscientific of me ... but there just is and that this is barely mentioned in the discussion is troubling -- this was a pilot study, remember. Usually these sorts of anomalies are paid attention to more in pilot studies because of the effect they can have on the outcome of statistical analyses. We are not talking newly diagnosed subjects here either (three prediabetics in MCCR and one in LCK not withstanding). We're talking an average around 7 years living with diabetes and thus likely well familiar with "standard advice". The three "gainers" went from (1) 6.8 to 9.8, (2) 6.4 to 7.7, and (3) 6.4 to 7.3. I think it goes without saying that we can ignore #3 (gained 15 lbs) as being at all diet related ... this person clearly didn't follow the diet. No mention of this was made. There was mention in the paper of #1's 3-point climb as an outlier, but only in so much as the mean HbA1c was still better for the LCK without it. How about without it and controlled for gender? There was no effort made to determine the source of this aberrant result. Was this the person who moved away but still participated in the tests? Either of the other two? Were any of these three the subject whose glipizide was discontinued, perhaps inappropriately? Were these the untreated diabetics or the prediabetics? There are many unknowns, but I know this ... IF this group had been monitored as closely as the LCK group was for hypoglycemia and ketones, then at least #1 was due for an increase in medication or a re-evaluation of how well they were following the diet, etc. Of course doing so would have blunted the interpretive impact of the rising HbA1c. Ditto the weight gain for #3. Remember ... The MCCR group reported reducing total carb intake in the diet by roughly 50 grams per day. Increases in HbA1c of this magnitude don't even fit the low carb talking points on this front. The low carbers will ignore this. It's OK. I understand bias. The study authors shouldn't have. It's not really OK. I don't understand bias in this context. 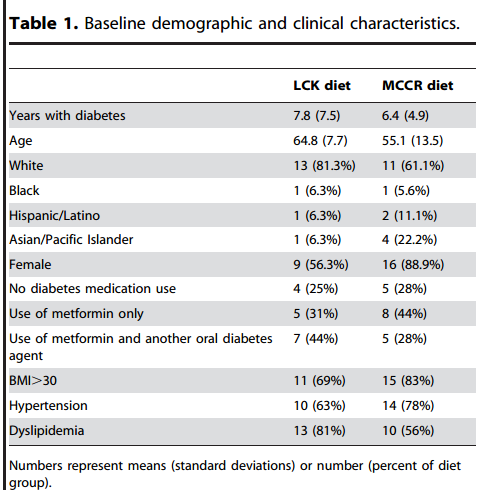 The "brag" is that 44% of LCK discontinued one or more diabetes med, while only 11% of the MCCR group did. Here are the numbers. As with prior studies conducted by Dr. Westman at Duke (16 weeks just LCD 2005, and 24 weeks LCD vs. LowGI 2008) by far the main effect of a low carb diet is to reduce medications that boost postprandial insulin secretion (sulfonylureas) or exogenous insulin itself. Given as the LCK group was under 7.0 HbA1c to begin with, and this was the criterion to stop such medications, this result is no surprise. If your view of diabetes is such that any insulin production is a bad thing, then VLC is your ticket. However, this notion that eating carb and either supplementing directly with insulin or stimulating insulin secretion is a bad thing is misguided. I've made this analogy before, and I'll make it again. The low carbers seem to have NO compunction with taking thyroid hormone when their thyroids under-perform. Why is there such downright nastiness about a diabetic using insulin/insulin-promoters?? Where the real story lies is in the metformin. One could argue that 18% of LCK were able to discontinue metformin while only 8% of MCCR did ... or that the percentage of metformin takers dropped 13% on LCK vs only 5% on MCCR ... but this is silly exploitation of the means of representation to exaggerate the results here. The same fun-with-percentages game Westman employed in reporting his study results. Nevermind that the MCCR group clearly had more with a need for metformin to begin with. In the end, we're talking one or two people in each group involved here. For all intents and purposes, taken together with the Westman studies, we have the picture emerging that when "accountable and verifiable", VLC generally does not eliminate the need for diabetes medications. It merely reduces those to deal with the carbs that are eaten, and does nothing to deal with the insulin insufficiency and/or hepatic IR. Instead of restoring beta cell function, these people insist on eating a diet that requires supporting Big Pharma by taking metformin. Yes, that's a snarky statement in the spirit of how many view diabetics who might choose to consume carbs and take the insulin or meds to handle them. There really is no difference. One could even argue that, in the case of insulin, those folks aren't taking a drug but rather hormone replacement therapy. Metformin is a pharmaceutical drug. I don't really care that it has a good track record and not a lot of bad side effects. If you are taking this drug to keep FBG in check, it is likely because your body is not producing insulin properly in the middle of the night (I'm going to blog on this soon I hope), and/or your diet has not corrected your relative postprandial insulin deficiency so that glucagon is not appropriately suppressed in the postprandial state. You are a pharmaceutically dependent diabetic. Not that there is anything wrong with that, just quitchyer sanctimonious down-the-nose glancing at other diabetics who choose to manage their diabetes differently than you do. And incidentally, the lack of glucagon suppression is why you might see blood glucose rise after a protein containing LC meal ... NOT because protein might as well be chocolate cake. If protein makes your blood sugar go wonky, you are not metabolically healthy. Lowering protein and eating even more fat? Not likely to solve the problem. I know, I know ... you're a special snowflake .. but everyone else whose body abides by the laws of human physiology. Those people. Aside: I did some looking into the sulfonylureas and plan to blog on why I don't think these are a good idea. See? I think there's some agreement there with the low carb contingency! Participants within both groups reported significantly reduced carbohydrate and sweet cravings, emotional eating, hunger, and eating disinhibition but increased dietary restraint (Table 3). When the two groups were compared there were no statistically significant differences in changes in these measures between groups. There were no statistically significant changes in depressive symptoms and positive affect within either group, nor were there statistically significant differences in changes in mood between groups. In the LCK group, participants reported statistically significant decreases in diabetes distress, negative mood between meals, and perceived disconnection between psychological and physical states. As each of these measures also tended to decline in the MCCR (though without statistically significant declines), comparisons of change in these measures between groups did not show statistically significant changes. TL;DR version? There were no statistically significant changes so probably no need to investigate further with this sort of study design. Imagine if you will, that instead of presenting this as one large RCT, it had instead been presented as two, separate, uncontrolled trials. In Study One you have a more racially/ethnically homogeneous group (80% white) split almost equally on gender lines (55% female). The dietary prescription was simple (mostly aim for under 50g carb/day and replace with fat instead of protein). Further compliance was measured with twice-weekly ketone monitoring and twice-daily BG readings to avoid hypoglycemia. In a generally well-controlled population to begin with a mean reduction in HbA1c of 0.6% was achieved and all taking medications in addition to metformin were able to eliminate those medications. In Study Two, you have a more heterogenous group (60% white) heavily female dominated (90%). The dietary prescription was vague and somewhat arbitrary. Subjects were instructed not to cut protein (no mention of accurate assessment of baseline intake or instruction/monitoring to ensure this), to consume 45-50% carb for which they were given some guidelines, and to reduce fat. A 500 cal/day deficit was prescribed based on a formula which differed from reported baseline intake by 50%*. Over 20% of the subjects clearly failed to comply as they either didn't lose or gained weight, including one that gained 15 lbs. Further, mean protein intake dropped 30%. Of those that "responded" to the diet with favorable changes in HbA1c, the mean drop was 0.4%. Of the three subjects with significant increases in HbA1c, the cause is unknown except that one was not diet related as this person didn't comply to the protocol. As these subjects consumed significant carbohydrate, those on medications to manage postprandial hyperglycemia continued on those meds. I submit that had this been written up as two studies, one would have difficulty drawing comparisons between them. I'm quite confident that if Study Two was conducted with a poorly implemented LC diet, it would be torn to shreds on that basis. But since it is the "low fat, status quo" ... it's shrugs all around and pass the bacon-wrapped butter please. At baseline, the subjects self-reported consuming 38-39% fat. Considering that fat is the most under-reported macro, this is yet one more indicator that a low fat diet is not being consumed by Americans who find themselves obese and/or diabetic. At baseline, the subjects self-reported consuming about 200 grams of carbs or 40% carb. While a diabetic population may be consuming less than the average, this flies in the face of the 400-500g figure tossed around so frequently. They could have under-reported given the study would entail VLC for some, but in context they were likely not carb hounds. The changes in the MCCR diet involved a slight increase in % cals from protein, slight decrease in % cals rom fat, and essentially no change in % cals from carb. In other words, they ate less of the same foods as before. It is not unsurprising that this strategy doesn't work so great. No, that statement is not in contradiction to my stated beliefs or CICO. It is simply that when you change the make up of your diet drastically - virtually eliminating entire classes of foods - caloric restriction tends to follow "naturally". If one tweaks their habitual diet without careful monitoring, it is unlikely that changes will remain after a very short period. Neither diet even comes close to being low fat -- not in any context. Not by the 30% USDA line, and most certainly not by comparison to the fat content in the diets of the vast majority of humans alive today or living on this planet for tens of thousands of years. This reported fat intake was in line with most of the paleo clinical trials. 3 Months: The Jonsson study in the above table was a crossover study with each leg 3 months in length. The results of which are muddied by some pooled results. At right are the HbA1c changes for the first leg. Black circles are diabetes diet first with a 0.4% reduction in HbA1c, open circles are paleo diet first, with an HbA1c reduction of just over 0.9%. That's a pretty interesting comparison to these keto folks as carb intake was around 125g for the paleo dieters (while fat was at 58g). Compared with LCK, the paleos in Jonsson consumed more than twice the carb and almost half the fat of LCK yet achieved a greater reduction in HbA1c of 0.9 vs. 0.6. LoBAG: Since I recently blogged on these, I thought I'd put this reduction in HbA1c in context. For 30%P/20%C diet containing around 140g carb, HbA1c was reduced 2.2% from 9.8 to 7.6 in just 5 weeks. For the 30%P/30%C diet containing just over 200g carb, HbA1c was reduced from 10.8 to 9.1 or a net 1.7%. "Crash Diets": The Lim et.al. diet on the right in the table below is now pretty routinely referred to as the Newcastle Diet. It is even being implemented in hospitals in the UK! The links to the studies and further discussion is HERE. It must be repeated, because the low carbers choose to ignore this time and again, that the VLCal diet was a PSMF for 8 weeks after which diet was basically standard for diabetes management. Note that the participants even regained some weight. In 2 months their HbA1c dropped 1.4% points. These subjects were of similar weight to the current study and in just 8 weeks exceeded the LCK group in pretty much every comparable way. Further, over the next 3 months, after eating a "usual care" diet and even gaining back some weight, HbA1c only inched back up 0.2% for a net reduction of 1.2% -- twice that of the LCK in this study. OK ... I ran out of gas here. Having trouble comparing any of these studies to the current one? I agree, there are issues and bones to pick for any head to head. But, AHEM!! Those apply to the two groups under one study roof as well. I could have thrown in a few MaPi, traditional Pima and traditional Hawaiian diet studies (all high carb) for effect too. Like I said, I ran out of gas. Disclaimer: this study was not ground-breaking; it was confirmation of a phenomenon that is starting to become well-known, and soon to be the status quo. That is, advising an obese diabetic patient to reduce their carb intake consistently produces better results than advising them to follow a low fat, calorie restricted diet. Besides the results about medication usage, another interesting finding was the pseudo-spontaneous reduction in calorie intake in the low carb group. It worked in an ‘ad libitum’ setting, which suggests it can work in real life. I say “pseudo-spontaneous” because they actually, mindfully, reduced carbohydrate intake, but these calories weren’t fully compensated for, leading to an energy deficit. The LFD group actually restricted more calories than they were asked, but they lost less weight. So they were either more severely under-reporting food intake or energy expenditure declined to a greater extent. Either way, it doesn’t bode well. In between we were treated to a defense of 24 hr diet recall, presumably to reinforce our human nature to believe the MCCR cohort actually ate consistently fewer calories than the LCK cohort but lost only half as much weight. We are also treated to a discussion of why 3 months "isn't short" and actually almost "long" by RCT standards. Come on Bill. Can you at least acknowledge that the "well known soon to be status quo" improvements witnessed in RCTs of some version of LCHF (usually not quite as LC and definitely nothing like the HF) tend to maximize in the sweet spot of 3 months? In almost every study the trajectory is the same. What happens from 3-to-6 months varies a bit -- between either slowed but continued improvements, to the beginning of the backslide -- but this is the honeymoon. Before all the long term effects of this diet in maintenance kick in. Nah let's just ignore those, shall we? Let's also ignore that spontaneous caloric restriction is not a mystery, and almost always relates to higher protein as a percentage of calories (so that absolute levels remain relatively constant on LC diets). Not always the case, but most often. Do ketones factor in further? Studies show that yes, they do in some more than others and for varying time frames before the effect often wears off. Does monitoring and accountability factor in? Of course. Whenever calorie deficits are established with measurements vs. estimates and compliance verified, you get better results than with quarter-hearted attempts like implemented here. But let's just ignore that these LCHFKD-whatevah diets tend to outperform pitiful examples of HCLFD mostly because the deck is stacked against the latter. I'm not even a fan of the latter and I can see that!!! I could have thrown in a few very high carb studies employing real traditional diets, but let's not clutter the landscape with any TRULY low fat diet studies!! Right? That doesn't fit in with the whole Keys=TheDevil inspired low fat was an obesogenic mistake paradigm. Do or did some of the Newcastle participants relapse into diabetes? I'm sure. Ditto others. Usually due to abandoning basic changes that lead to a regain of weight. In the case of early insulin treatment, sometimes a week or two buys a large portion of diabetics up to two years of freedom from all medications. Should we ignore that out of misplaced fear and hatred of insulin? Oh ... and Saslow is doing a follow-up called SUCCEED. Here's hoping the MCCR is better implemented this go round. With only metformin for meds allowed, the results will be interesting. See you in a few years! Or perhaps she could do something really groundbreaking and pit the LCK against Newcastle. THAT I'd love to see! My question is how come NO ONE bothers to mention the Ma-Pi Macrobiotic diet? Every study shows that it gets Insulin Dependent T2D off insulin. Why not do more studies with that? Why do the low carb proponents totally dismiss it? Because it goes against their paradigm? Thanks you for Evelyn, for laying the built-in biases against MCCR cohort in this study. I have bookmarked this post, you did a great job breaking down the facts to show just how important it is to not take research as face value. This particular study is deeply flawed because there can be no external validity taken from it, simply due to the fact that qualities of the two cohorts are too different from each other, thus voiding the results as being representative of this particular population. Poor control over independent variable in the MCCR cohort, while LS exerted stricter controls and perhaps influence over LCK cohort. Anyone who has taken an introductory course in health sciences research at the graduate level can see through this nonsense. pilot studies are one suggested reason for "decline effect"
Thanks dancer! The skeptic region of my brain was first stimulated by the fact that this was in PLoS and yet Phinney's name was in the mix. Plus you had 10 authors which is absurd for a single pilot study. Ten author papers should be extensive reviews. It is unconscionable to me that Phinney did not disclose competing interests. Especially since "nutritional ketosis" is sprinkled about the paper. While you will find this term in some literature, its modern usage is mass-media-diet-book-speak that Phinney, along with Volek and to a lesser degree Westman, have worked tirelessly to add into the lexicon. There are certainly dietitians out there trained in ketogenic diets, so I find LS's involvement on this level at all to be highly suspect. Boggles the mind what researchers will try to get away with. Study design is not that difficult. 25% protein and less than 30% fat. At 12 weeks, the mean change in BMI significantly favored the two-meal diet over the six-meal diet (–1.23 kg/m2 vs.–0.82 kg/m2; P less than .001), Dr. Kahleová said. Waist circumference shrunk significantly more as well (–5.14 cm vs. –1.37 cm; P less than .001). Fasting plasma glucose decreased in response to both diets, but the decrease was significantly greater with two meals per day (–0.78 mmol/L vs. –0.47 mmol/L; P = .004), she said. C-peptide followed the same pattern (P = .04). Hepatic fat content, as measured by proton magnetic resonance spectroscopy, decreased significantly more with two meals per day (–4.2% vs. –3.4%; P less than .001). HbA1c decreased comparably in both diets, Dr. Kahleová said. Fasting plasma glucagon decreased with two daily meals (P less than .001), while it increased with six meals (P = .04). Both parameters of beta-cell function – insulin secretion and glucose sensitivity – increased comparably with the two diets, Dr. Kahleová said. Changes in glucose sensitivity (P = .02) and oral glucose insulin sensitivity (P less than .001) correlated negatively with the change in hepatic fat content. The correlations were no longer significant, however, after adjustment for changes in BMI. Very interesting ... I'll have to take a closer look at this one! Sorry, that was my bad... I was trying to post a gif but Disqus condemns my comments with URL into some kind of moderation pool. So I uploaded a file, and this time, but it didn't post as an animated gif because that would've been even more hilarious. M3G4 PH4IL! A very nice, long-winded way of saying "I will never acknowledge that a LCD is superior to anything so long as I shall live even though the evidence has hit me in the face several thousand times cuz I want to eat my bagels and pizza!!!" The data is the data. I agree that the trial is small. And I agree that the differences were small.